How often do you find yourself on holiday taking notes on the decor of your hotel, a restaurant, or even in the colours of nature around you? We often want to take a slice of our luxury holidays home with us, but have you ever considered turning your home into your favourite destination with some travel interior design? From the kitchen to the garden, there are many ways to infuse a little travel into our daily lives, such as these must-have home accessories for travellers. Whether it’s on-point Nordic house interiors to Moroccan interiors or vibrant silks from Asia, we have travel inspired home decor ideas that will fit the bill. These statement pieces will not only provide your interior spaces with a refresh, they’ll also serve to remind you of faraway destinations at times when you’re unable to pack your bags for another holiday. And this selection goes to show that theming your interiors can be as subtle or as daring as you wish. So go loud and proud or chic and sleek to carry off the perfect effects for your home. Some links here are affiliate links and we receive a small commission if you click and purchase from them, at no extra cost to you. Thanks for your support! No time for DIY? Work with what you have, and by adding a few of these furnishings and accessories you can still pull off an enviable look. 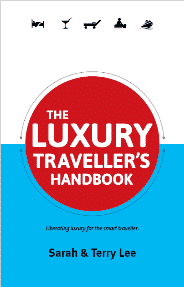 Recently updated your space with a travel-related theme? If you’ve got it, flaunt it, share your makeover story with us at the end of this feature so we can all be inspired to bring the world home. It couldn’t be simpler to adopt the flavours of South America into your home. Think warm shades, striking patterns and woven materials to perfect the look. 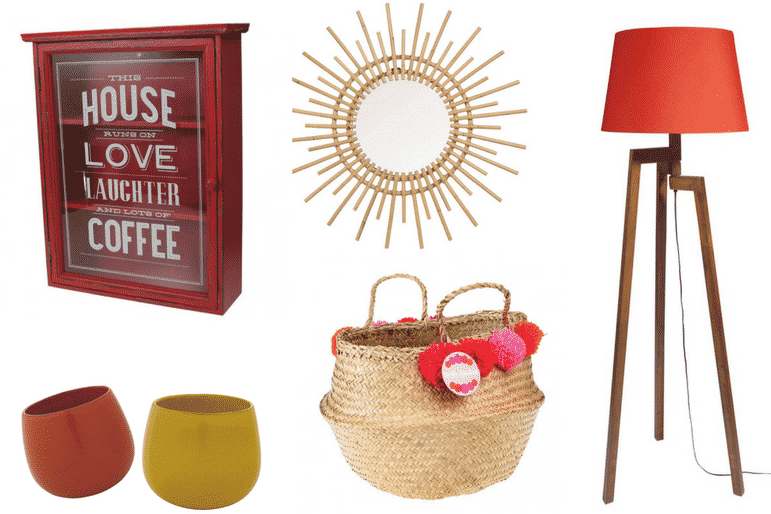 Clockwise from top left: Vintage Wooden Cabinet, Rex London, £145; Round Rattan Mirror, Maisons Du Monde, £59.99; Tripod Lamp, Maisons Du Monde, £168; Pom Pom Basket, Rex London, £25 and Ceramic Plant Pots, Wayfair, £8 each. Don’t be afraid to go bold with these sweet tropical accessories to add instant pop to your home. Just remember less is more, so you only need add a few accents to create the perfect Caribbean home interior design theme. Go for sunshine yellows, watermelon reds and oceanic turquoise. You can also play with prints such as botanicals, and fun shapes – pineapple ice bucket, anyone? 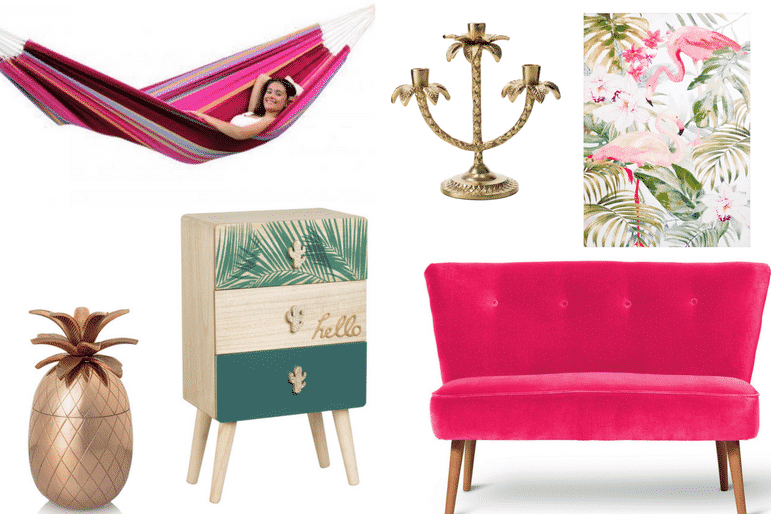 Clockwise from top left: Barbados Hammock, Simply Hammocks, £80; Tropical Candlestick, House of Fraser, £24; Tropical print canvas, Maisons Du Monde, £51.59; Velvet Cocktail Chair, Oliver Bonas, £585; Storage unit, Maisons Du Monde, £59.99 and Copper Pineapple Ice Bucket, Oliver Bonas, £40. To keep things clean and simple, the Nordic home interior style is perfect for creating wide open spaces, while still being able to draw the eye with some centrepieces that add the wow effect. Think neutrals and pastels, luxury linens, fluffy rugs, wooden furniture and lots of minimalist walls and spaces. 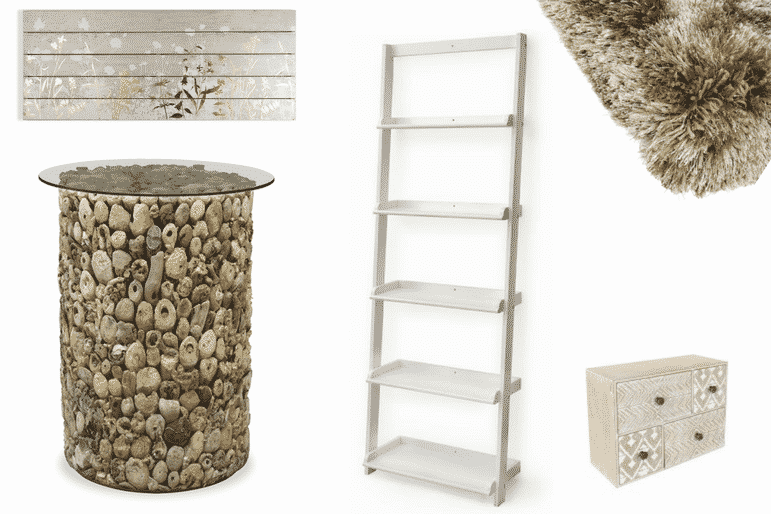 Clockwise from top left: Metallic Wood Print, House of Fraser, £55; Thick Shaggy Rug, Blue Sun Tree, from £129; Printed Drawers, Sainsbury’s, £16; Ladder Bookcase, Wayfair, £81.99 and Tall Side Table, Annie Maison, £180. 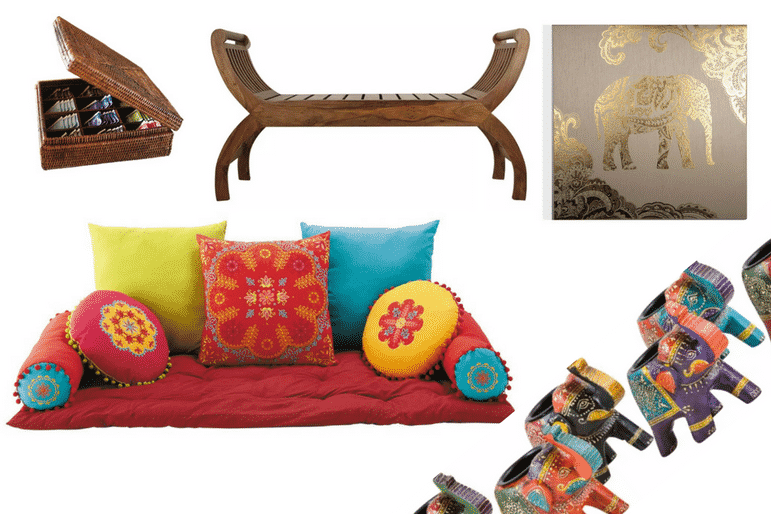 We love the diverse options you can work into Indian home interior design ideas. Choose elaborate designs with muted palettes or full on vibrancy. It’s all waiting to be played with and allows so much flexibility to tie these travel inspired home decor ideas in with your personality. Clockwise from top left: Rattan Tea Chest, The Holding Company, £34; Thakat Stool, Myakka, £279; Elephant Fabric Canvas, House of Fraser, £60; Tealight Holders, Myakka, £9 each and Roulotte, Maisons Du Monde, £146. Asian inspired interiors are a bold way to go if you’re redecorating. But while these patterns can be quite intense, you can still achieve a subtle feel with careful planning and consideration. 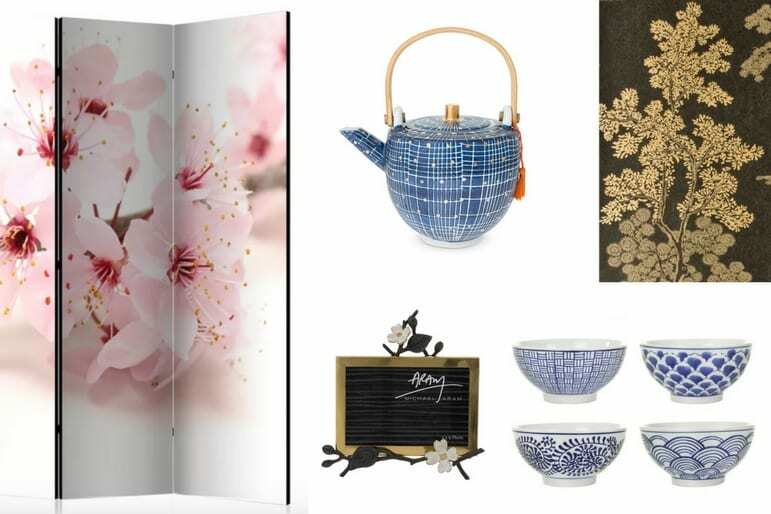 Clockwise from top left: Room Divider, Wayfair, £166; Porcelain Teapot, Oliver Bonas, £32; Oriental Wallpaper, John Lewis, £98; Sushi Bowls, Amara, £32 and Easel Photo Frame, Amara, £120. The eclectic prints typical in Moroccan design are a sure-fire way to instantly transform your kitchen, living room or bathroom. But the intricacies of the print mean it’s probably best to adopt the less is more mantra so you don’t drown your room. 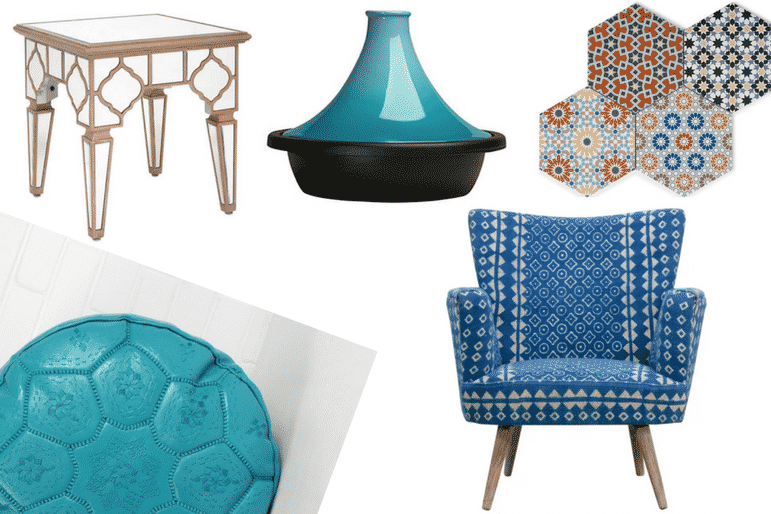 Here’s some Moroccan home interior design inspiration. Clockwise from top left: Medina Mirrored Table, IWOOT, £235; Le Creuset Tagine, Selfridges, £190; Hexagon Wall and Floor Tiles, £38.29 per sq. 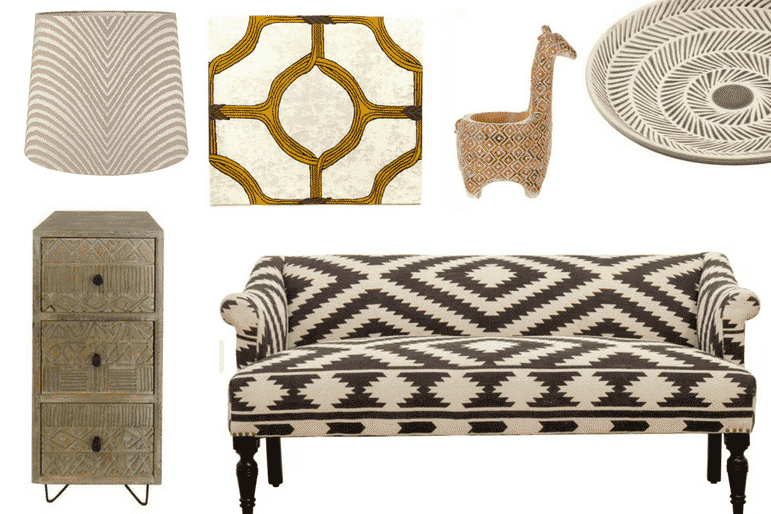 metre; Batik Armchair, Myakka, £649 and Moroccan Pouf, Bohemia Design, £100. If you want to add a bit of colour, but the likes of Caribbean prints and tones are too garish for your style, a more muted tribal and African palette is ideal for adding a little zest without going over the top. Clockwise from top left: Tapered Lightshade, John Lewis, £80-£110; Print Rug, Eva Sonaike, £750; Giraffe Planter, Sainsbury’s Home, £20; Tribal Platter, Dunelm, £22; Zigga Printed Sofa, Myakka, £999 and Drawer Unit, Dunelm, £35.